I had been wanting to read this book ever since I first saw that beautiful cover and when I realised it was on NetGalley, I jumped at the chance to grab a copy for review. I wasn't disappointed as I found my initial enthusiasm was well justified. This book has some wonderful characters and a plot full of great new concepts and ideas. I found the relationship between Adrian and Lindsay really believable and highly charged, and that was maintained throughout the story, which was good. The secondary characters, such as Elijah, also come across as well-formed and interesting. 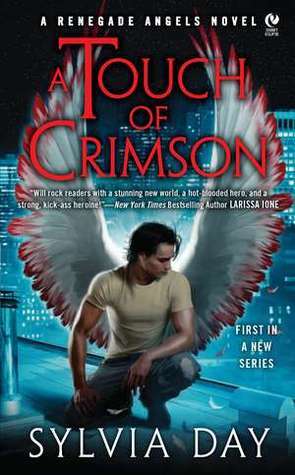 There was plenty of action in a plot that offered an interesting twist on both angel and vampire myths. There is really something for fans of all paranormal here since the story features angels, vampires and lycans and I loved the way these different beings were linked together. This was a hard book to put down and the ending left me eager for more. It was a great opening for the series with plenty of action and lots of ideas introduced that will no doubt continue into the next book. I will certainly be keen to continue reading and this may well be a series I decide to invest money in and get the print copies so that I can reread in the future. I've also been eyeing this on NetGalley, but wasn't sure if I should get it. It sounds great. I like how there are both angels and vampires -- and having a different twist on the myths is always good. Oh! Vampire and angels-just my kinda thing. Thanks for sharing!